So, you love to make cards. And you have a ton of them. 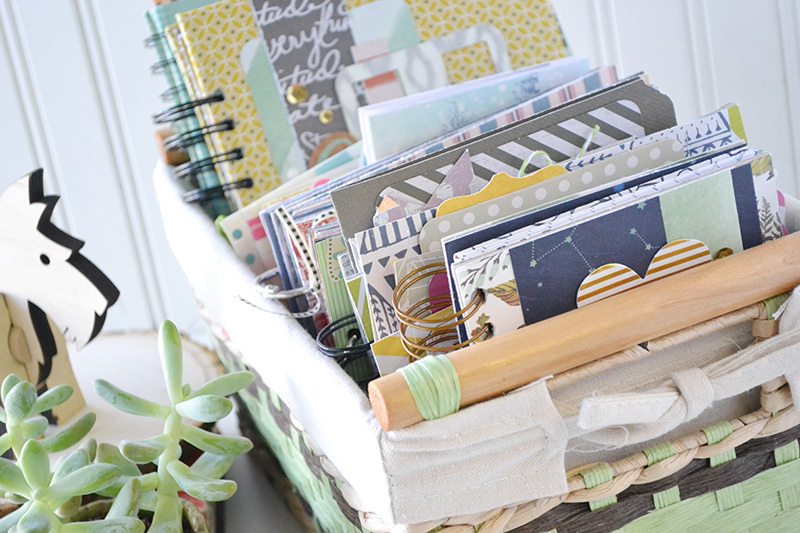 Or, you've been scrapbooking since the early 90's and you have buckets of mini albums. Even some shaped ones, acrylic ones, and those ones with all the ribbons tied on the binding wires. Remember those? What do you do with them? How do you store all those beautiful cards and mini albums you've worked so hard on over the years? 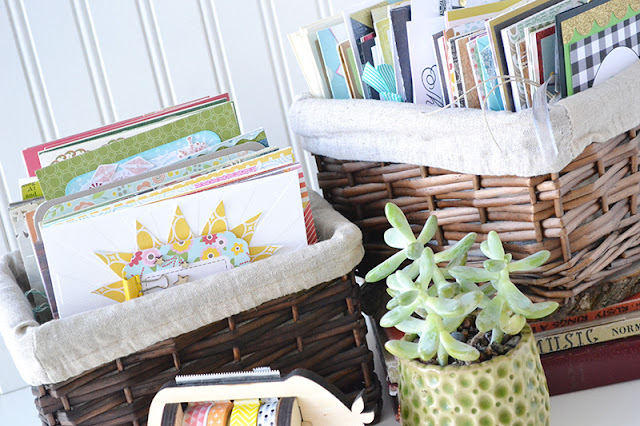 Today I've got some card and mini album storage tips to share with you so you can keep those works of art safely stored, organized, and on display for you and your family to enjoy. Let's start with mini album storage tips. I've created a few dozen of them since I started scrapbooking 18 years ago. Several I've given away as gifts, and I've kept over two dozen. I love to create mini albums that are themed, because it gives me and my family a bite-size glimpse into one aspect of our lives. For example, I've created mini albums just about my daughters' relationships, my relationship with my husband, my sons' personalities, the homes we've lived in, our Halloween costumes over the years, what I'm thankful for each year, baby books for each of my kids, and more. My family and I love to pull those out and browse through them. It only takes a minute, but the memories that flood our minds when we look at these mini albums are priceless! I keep my mini albums out and on display in pretty rectangular baskets that I found on clearance at Michael's several years ago. Having them out, stored together, and easily accessible is such a blessing to my family and me. They elicit wonderful questions and discussions about our family history. 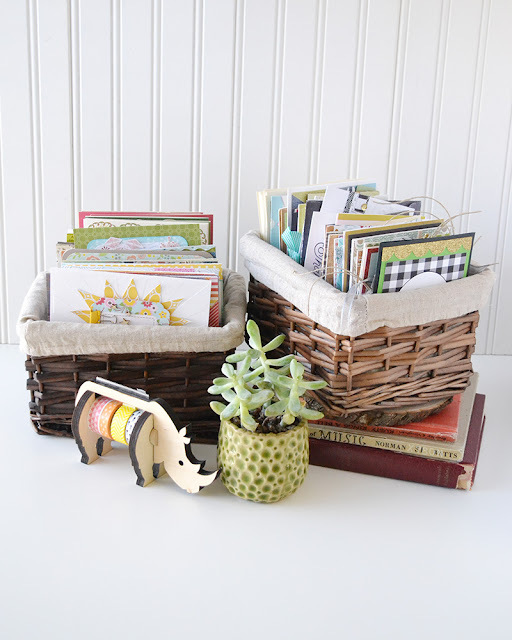 On to card storage tips. I won't even attempt to count how many cards I've made over the years I've been paper crafting. I didn't start making cards until about 10 years ago, but I've been hooked since then. I rarely buy a greeting card because I find I can make one for so much less money that says exactly what I want it to say. Plus, I get the benefit of a little fun crafting time! My finished cards have come in handy for occasions of all kinds--birthdays, weddings, sympathy, friendship, thank you's, and everything in between. I also love to find a random reason to give someone a card. There is always someone who needs a little light and love in their life. Thinking about whose day I can brighten, and sending them a handmade card make me so happy! I also store my cards on a wall mounted shelf in my craft room in small rectangular baskets I found on clearance from Michael's years ago. I love that I can remove the fabric lining in these and wash them so my cards stay clean and pretty. 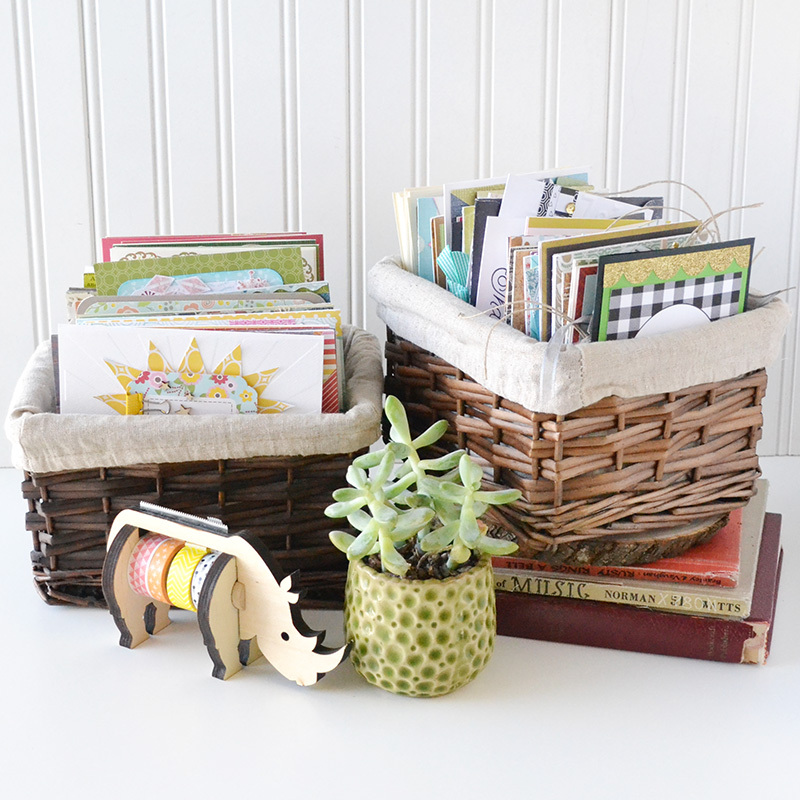 I've got all my 4.25 x 5.5 cards in one basket, and all my larger cards in another basket. I keep similar themes together--all the birthday cards next to each other, the wedding cards together, etc. That way it's easy to find what I'm looking for. Pre-made envelopes are stored behind all the cards. Though I do enjoy using my Envelope Punch Board to make matching envelopes from cardstock or patterned paper sometimes. 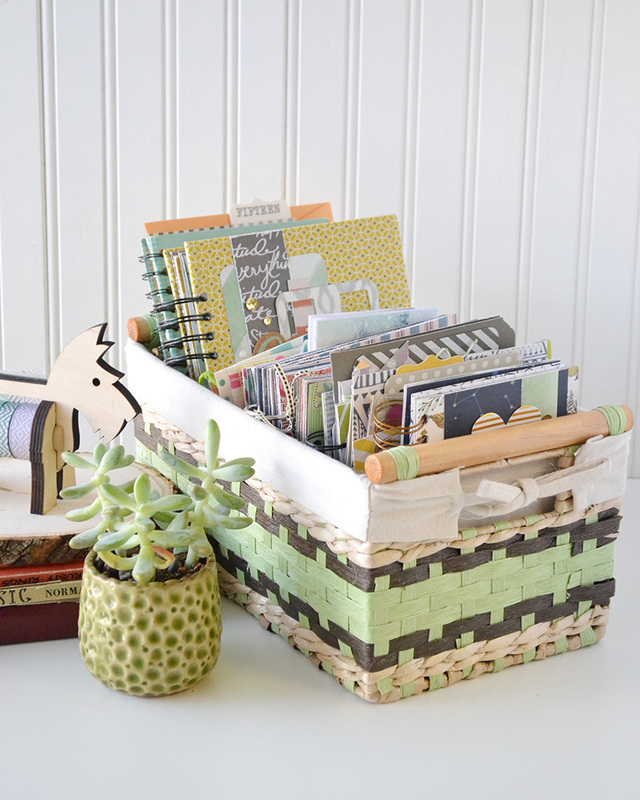 Well, I hope these storage ideas and tips for cards and mini albums have inspired you. I'd love to hear how you store your finished projects. Leave a comment below and tell us all about it!